You can come to B & G Auto Repair whenever your car needs service, whether you know what the issue is or not. You'll enjoy fast, reliable work that comes with our guarantee. While we are happy to tackle repairs of any size, we also offer routine maintenance for proper upkeep that helps your car stay on the road longer. Speak with one of our representatives for details about our garage. for brake repair or oil change service? Our mechanics can take care of all your car repair and auto service needs. San Francisco, CA for a quote today. B & G Auto Repair, formally B & G Automotive, provides excellent rates on car repair and auto service. The mechanics at B & G Auto Repair pride themselves in quality service and prompt repair for all makes and models, whether foreign or domestic. All of our work is performed according to your car manufacturer's factory maintenance schedule, keeping your vehicle like new. Conveniently located in SF, our friendly, reliable service extends beyond the usual garage work of our competitors. You can drop off your car 7 days a week and receive a complimentary ride to and from our shop. 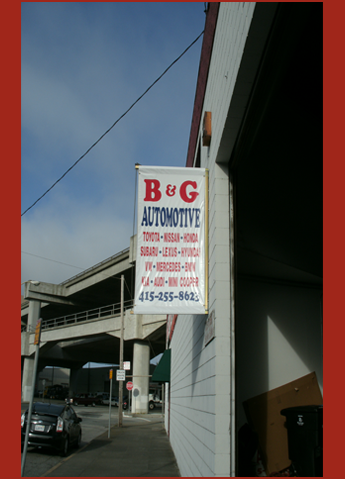 B & G Auto Repair has served the SF Bay Area community for more than 25 years. Monday, Tuesday, Thursday, Friday: 8:30 a.m. - 6:00 p.m.